Just found an extremely interesting video where Mozilla’s Aza Raskin explains how they are thinking of the future of the web. 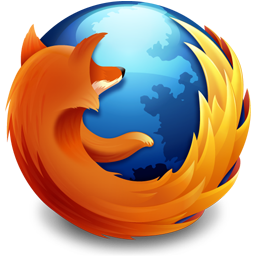 Firefox 3.5 has been released today. Many improvements over 3.0. Faster, better privacy options, better standards support. Get it now. 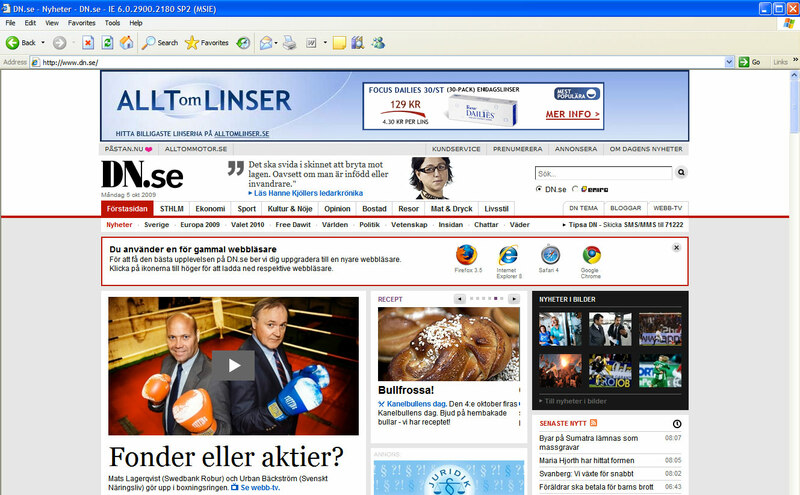 At the end of March, we launched a new version of our website at Eskilstuna-Kuriren, ekuriren.se. We replaced our ancient content manger with a new, modern, flexible system known as Polopoly. 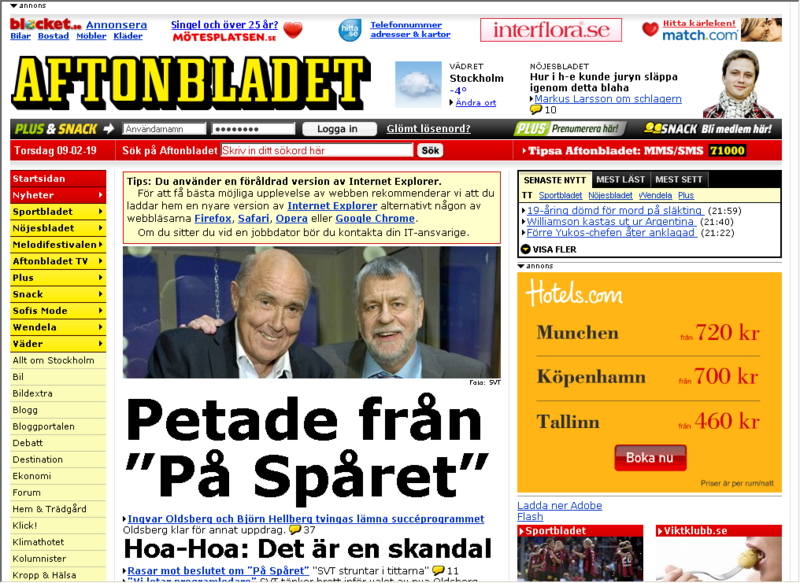 Polopoly is developed in Sweden and used by many of the large Swedish news sites. The launch went smoothly, but soon we started getting e-mail upon e-mail from users about speed problems. After a while it turned out that many Internet Explorer users were having huge problems both loading the page and scrolling the page. 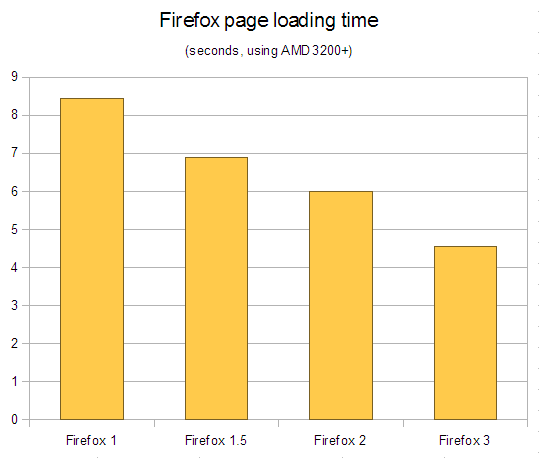 Apparently, when loading the website in Internet Explorer it can sometimes make the whole computer slow down to a halt, forcing a hard reboot. If you manage to load the page, it can scroll painfully slowly. 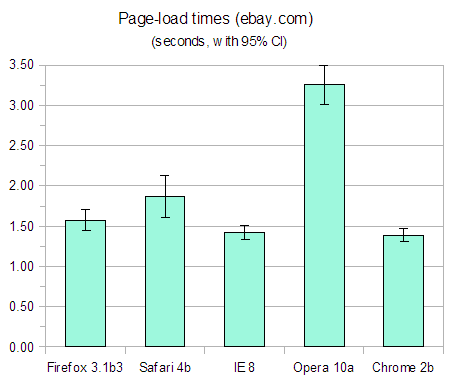 Obviously, this mainly shows that the site hasn’t been properly tested. 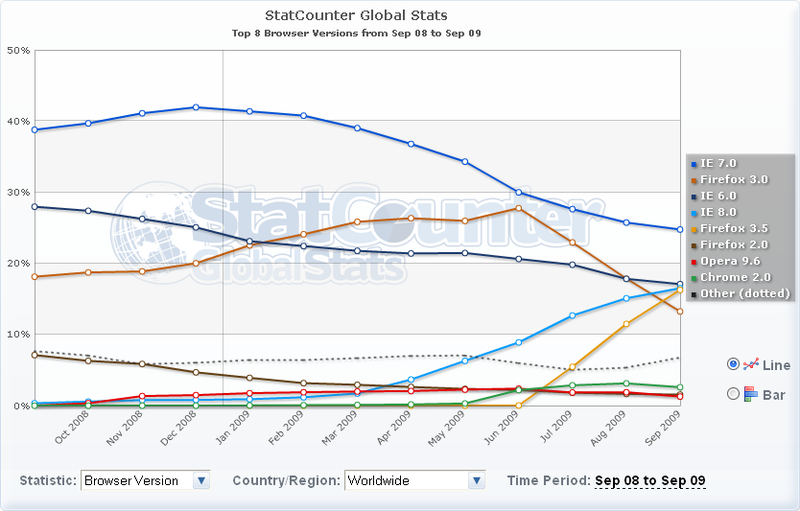 A huge majority of our visitors use Internet Explorer. Or at least they used to. Perhaps the percentage has gone down now, from people simply giving up on us. It truly amazes me how the developers still haven’t properly managed to sort out the performance issues. They have supposedly been working on this from day one, which is almost two months back now. 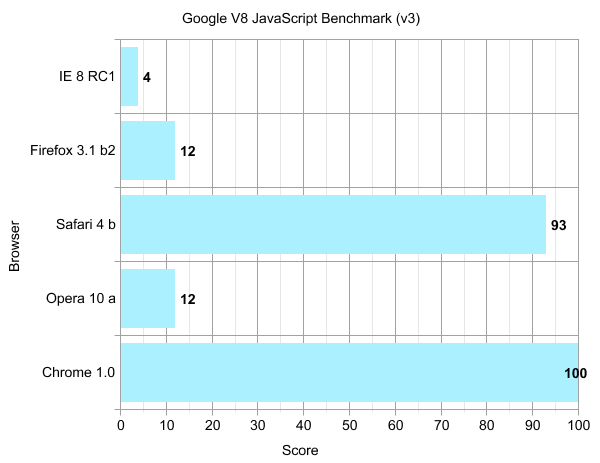 While I still haven’t actually heard a precise technical explanation of what the problem is, this experience shows in a very tangible way how big a difference there is between Internet Explorer and the more modern browsers when it comes to speed. Whether it is the scripting engine or the rendering engine or something else that is causing the problems for Internet Explorer users I don’t know. 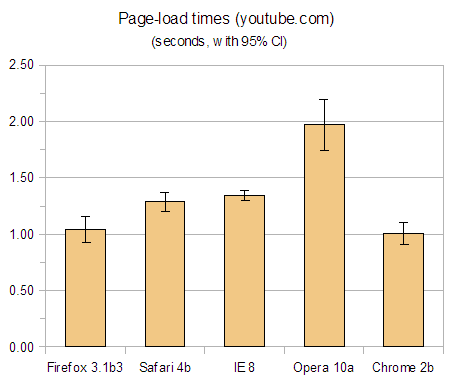 What I do know is that we simply haven’t had a single complaint about performance from Firefox or Safari users. Here’s to hoping that the site admins get the issues sorted as soon as possible and that all browsers will be able to display our news site without the user suffering serious illnesses from frustration. After finishing my slight redesign here I found that IE8 made a complete mess of it. Turned out of course that I had forgotten to change the doctype into something other than XHTML Strict, which IE still doesn’t understand. 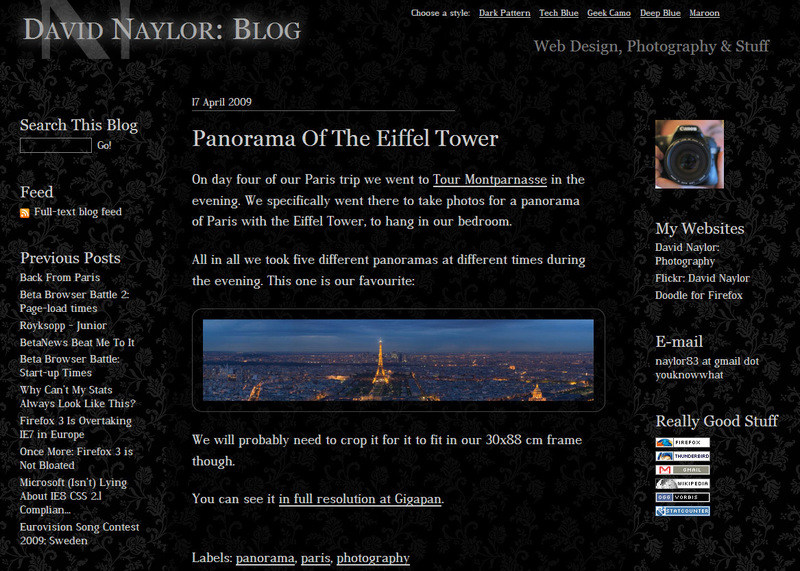 That was all that was necessary and now, miraculously, my blog looks … decent in IE8! Looks like it has finally understood my max-width rules as well! Amazing stuff. Well, this is the new modified design. Nice and tight and snug! Obviously the font size in the left column isn’t web 2.0 compliant, but you can’t get everything. So what has changed? To start with I removed a couple of things from the right column and moved what was left to the left column. Then I made the left column quite a bit tighter to allow for 1024 px images in my posts. I tried to use a sans-serif in the left column but the combination looked really weird. I decided to revert my choice to use a downloaded font, for two reasons: A, i find Georgia is actually prettier than Dustismo and B, I don’t really like how Firefox 3.5 (beta) deals with downloaded fonts at the moment. Firefox will display the page with the fall-back font first, and then redraw the page when the @font-face font is downloaded. This behaviour is annoying when viewing the page – Safari does this much better. Safari simply waits with displaying the text until the font is downloaded. While I was fiddling with the design I decided to remove the alternate stylesheets for a slight simplicity win. I have considered implementing columns in my posts, but I’ll need to think that through properly first. Edit: Argh!! Internet Explorer 8, supposedly CSS 2 compliant, messes the design up completely. I’ll have to look into that some other time. I decided to play around with web fonts and came across dafont.com. They have a great selection of high quality free fonts. I found Dustismo Roman which I’ve now decided to use on this blog. 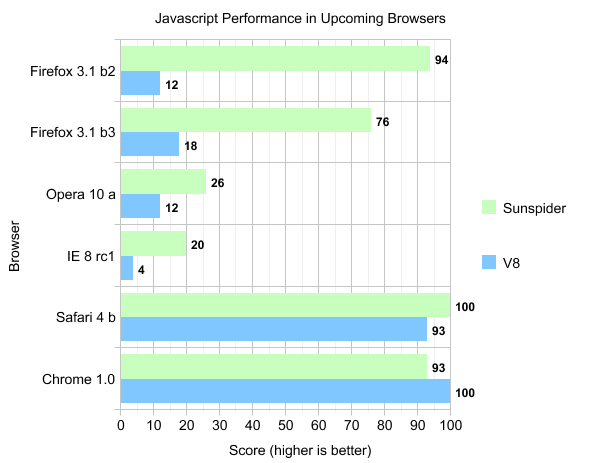 Anyone using the upcoming Firefox 3.5 or Safari 3.1 will be able to see it. Everyone else will see Georgia, which also is a nice font. By using @font-face rules in your CSS code, you can use any font you like! I.e. you aren’t limited to the system fonts that are common to Mac and Windows. 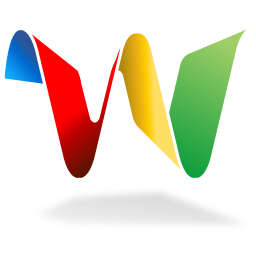 Read more about web fonts here. 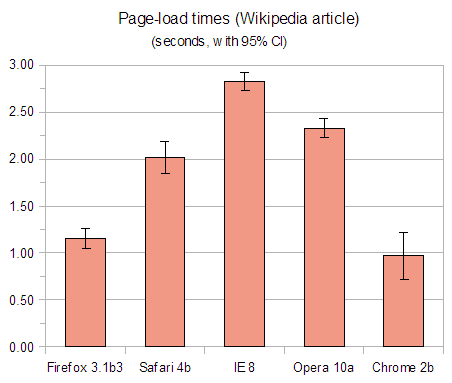 I was writing yesterday about perhaps doing a page-load test with the latest browsers. Minutes after posting I saw that Betanews already did one. 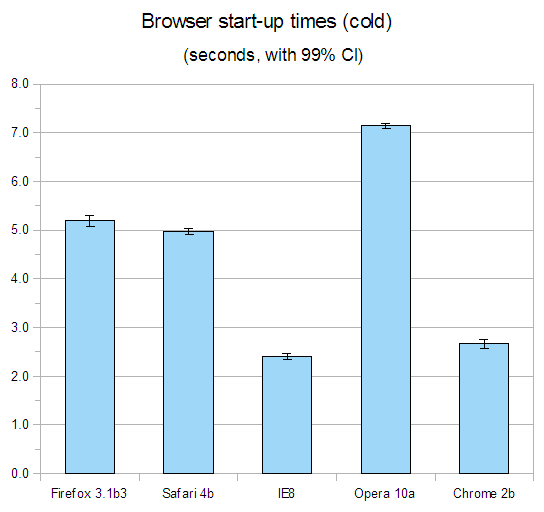 To cut a long story short: Chrome 2 beta wins, Firefox 3.1 beta 3 is second, Safari 4 beta is third and Internet Explorer 8 is fourth. Compare that with Microsoft’s own test where (surprisingly!) 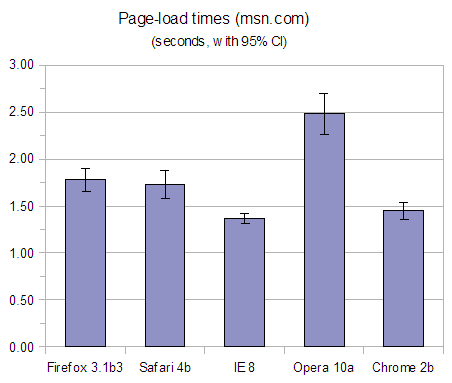 Internet Explorer 8 wins, basically testing the same sites as betanews. I might try to do test all the same though, for fun. And because more tests give a more complete picture of reality. 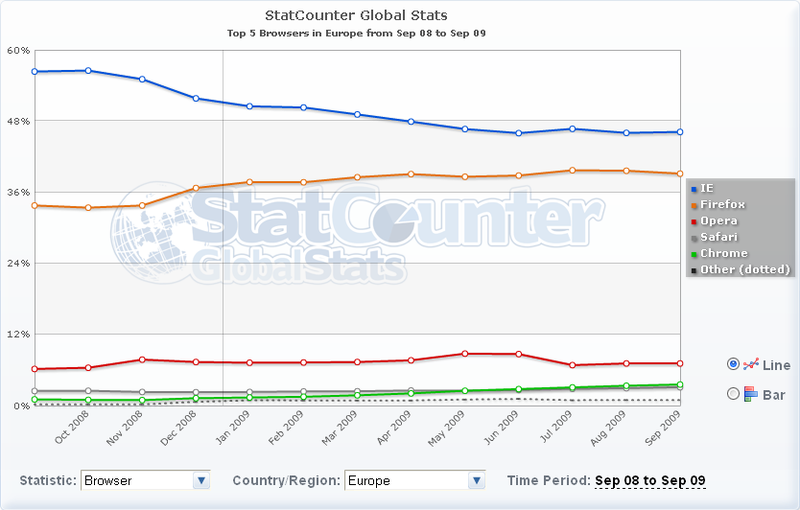 Firefox 3 is quickly becoming the most popular browser in Europe. 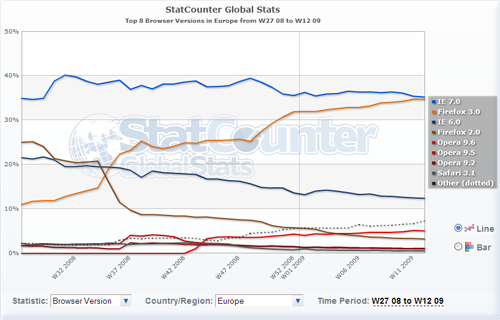 At the moment StatCounter shows it to be just a about half a percentage point below Internet Explorer 7. We believe that IE8 has the first complete implementation of CSS 2.1 in the industry and it is fully compliant with the current CSS 2.1 test suite. As I said, if I have misunderstood something, like for instance if the above tests aren’t considered part of the CSS 2.1 test suite, or if they for some reason should be ignored, do correct me. 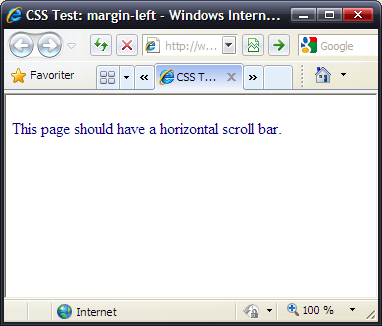 But if not, it seems like Microsoft are somewhat exaggerating IE8’s capabilities in the CSS 2.1 area. Edit: Removed a few of the tests which turned out to be fails because I had ClearType activated. Edit 2: Arron Eicholz of Microsoft has explained to me that the above fails are due to faulty tests. 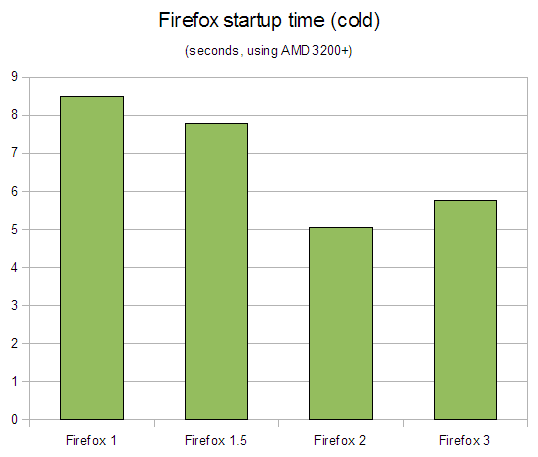 That would explain why Firefox also fails them. 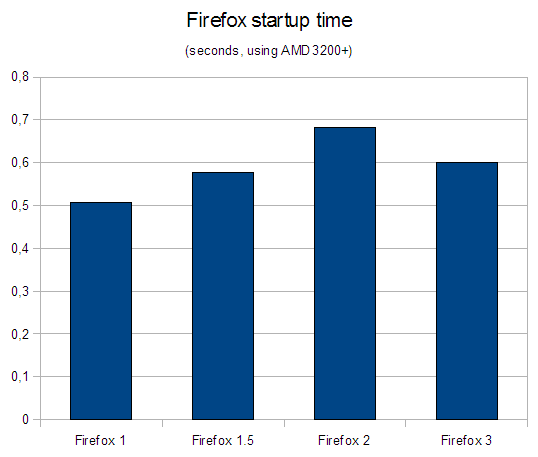 Edit: I just added the data from my previous test for the non-Firefox browsers, for comparison. I also made a nice new graph. 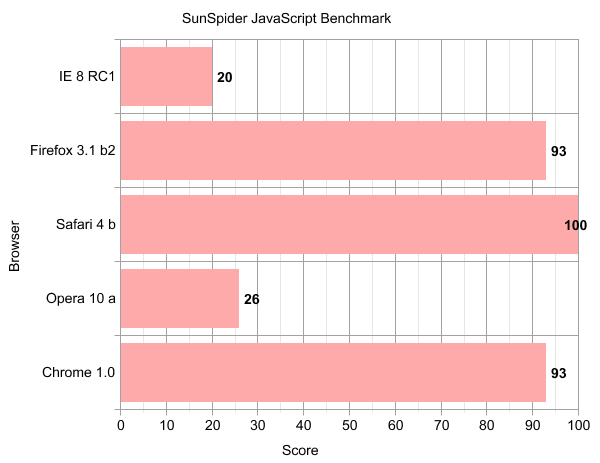 To make the two benchmarks more comparable I’ve normalized the scores (inverting the time data from Sunspider, turning it into speed). The winner of each benchmark is given 100 and the others are given relative scores. Does anyone happen to know why this is the case? 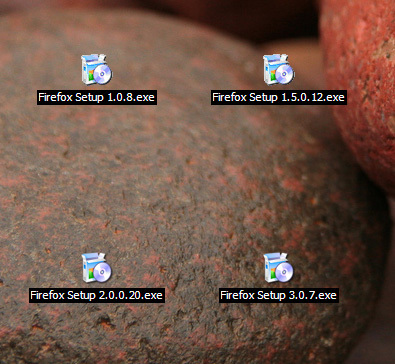 Was this a strategic move from the Firefox developers? 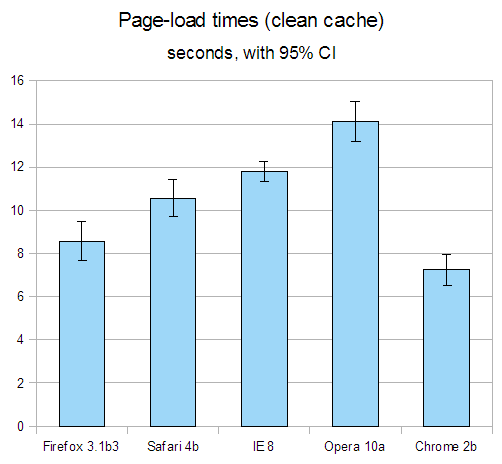 I mean, did they introduce this slight performance regression knowingly, intending to fix it for final release? 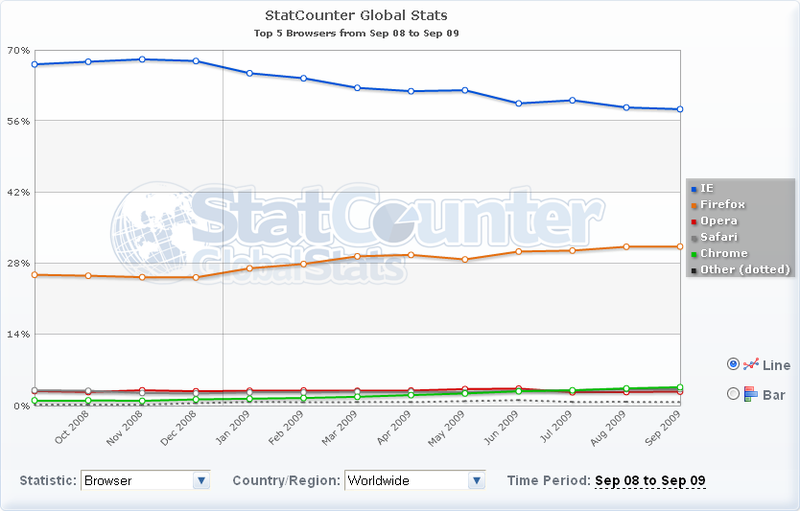 Statcounter have just launched a tool for graphing their global web traffic statistics. The interesting thing is that it puts Firefox at around 28 percent right now, while NetApplications measures Firefox to be roughly 21 percent. I’m guessing that Statcounter to a greater extent is used by individuals on blogs and smaller websites than NetApplications measured sites. 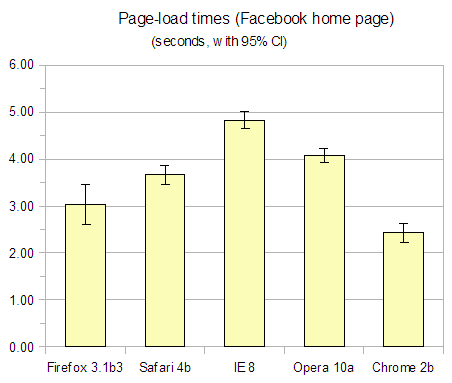 The personal sites get more visitors using their home computers where they to a higher degree use Firefox (than at work). 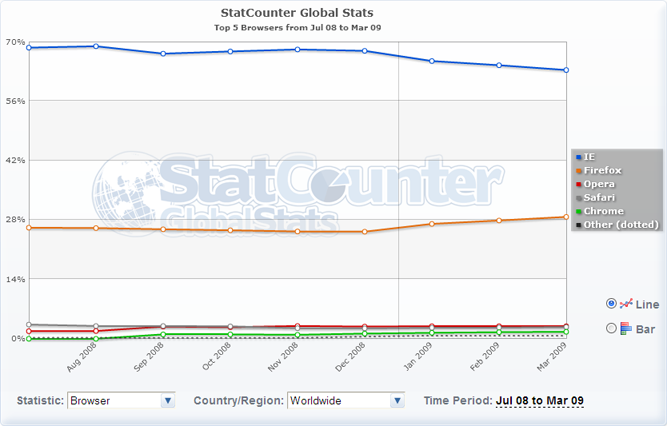 Statcounter says Internet Explorer has a mere 63 percent, which equals 2.25 IE users per Firefox user. Pretty cool how much has changed since 2004.